Join your friends and neighbors for some holiday cheer this Saturday! The first Estudillo Estates Holiday Stroll & Community Giving Day will be held this Saturday, December 1 from 1PM until 4PM. 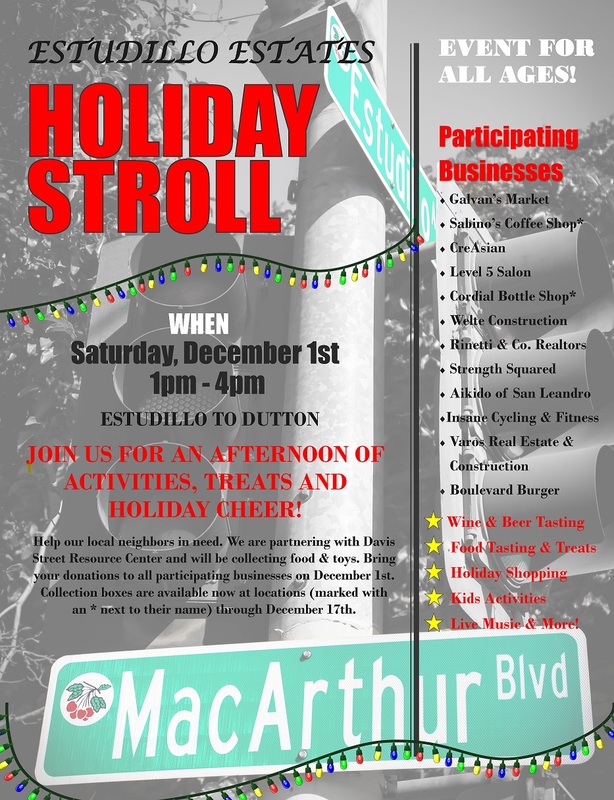 Businesses along MacArthur Boulevard, between Estudillo and Dutton Avenues will be offering wine & beer tasting, food tasting, holiday shopping, kids’ activities, and live music! All ages are welcome and the event will be held rain or shine. In addition to holiday specials, MacArthur Boulevard businesses are partnering with the Davis Street Family Resource Center to host a charitable food and toy drive. This event will aid neighbors in need by providing toys for presents and food for the holidays. Participants are encouraged to donate non-perishable food items and new, unwrapped toys to participating businesses during this event. Sabino’s Coffee Shop and Cordial Bottle Shop are also currently hosting collection boxes through December 17. Learn more below and here.